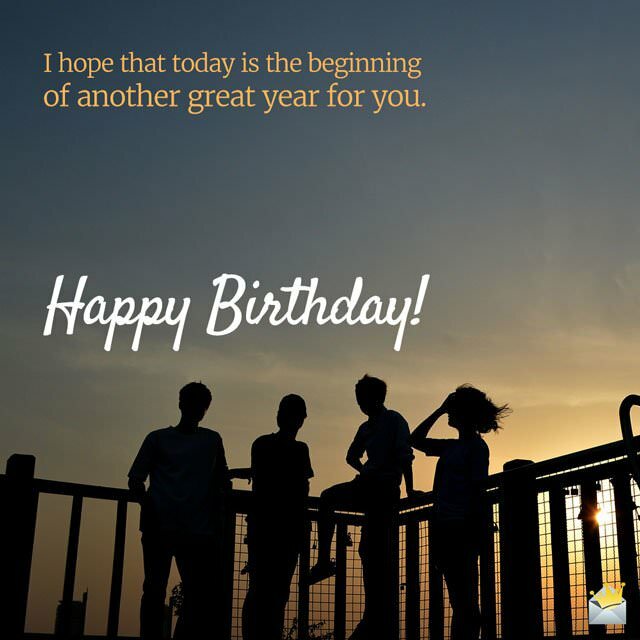 Normally, it’s easy to wish “Happy Birthday” to a very good friend, because optimal communication and maximum familiarity are exactly the reasons we choose our friends for. A happy birthday to a person that definitely deserves a lot more than this birthday wish of mine! Have fun, stay safe & take care of yourself, always. Happy Birthday, my friend. Not a single day has touched you inside. Happy Birthday! May the future bring you the fulfillment of even more dreams, but right now I’d say the past has treated you well. Happy Birthday! We’ve been through so many happy moments together that I might even take your happiness for granted. Happy Birthday! I’m glad you’re still my friend after all this time. Happy Birthday! It seems that all that we’ve been through has toughened us, but has also kept our friendship intact. Happy Birthday, man! Sharing my joys & struggling in tougher times with you has been a real pleasure. Happy Birthday, my friend! In good times and bad times, you’ve been a real friend. Thanks for being here & take care. Happy Birthday! Happy Birthday, buddy! Keep on living the max out of your life and being the positive person you’ve always been. May you live forever, because we’re the lucky people that enjoy life with you. Happy Birthday. For main course, I wish you joy, positivity, creativity & love. The rest are optional side dishes. Happy Birthday, my friend! With friends like you, I still have chances in conquering the world! Happy Birthday, man, it’s been a crazy ride! I went to my friend’s birthday party & all I got him was this lousy greeting card! Happy Birthday! Wishing you a breath-taking & fabulous birthday! Have fun, stay cool! I hope that today is the beginning of another great year for you. Happy Birthday! Birthdays come and go, but friends stay with you! However, now that the day is here, make sure you enjoy it! Happy Birthday! The meaning of friendship lies in the simultaneous flow of alcohol in our veins. Happy Tipsy Birthday! For a youngster of your three decades, you’ve accomplished a lot. Happy Birthday, buddy! The thing is “BFF”, “Yolo” & let’s party ASAP. In short, HB! Start counting the years only when you really can’t remember the number. Happy Birthday! A friend accepts you for what you are & I have to thank you for doing it with me. Happy Birthday, my friend! Age may be something that worries you only when you don’t have friends like us! Happy Birthday! Two Words from Cute Animals: Happy Birthday!